It was nicer today. The humidity was still very high when we woke after last night’s thunder boomers. But, it was still. No breeze at all. We ate our breakfast overlooking Gray Beach in Magnolia and noticed the boats facing into the slight swells that were coming from the southwest. The weather channel said 10-15 out of the northwest would eventually materialize. It was enough to send us south today. We started by buying diesel at the new facility right here in the Cape Ann Marina. They were very proud of their new setup and all the shiny new hardware. We were their first diesel customer. We continued out into the harbor and then south to Egg Rock, at Myanna’s request. She and Linda Giles were onboard today along with Paul Savageau and Laurent Dubois. Veronica, Peter, and Pat were crew. I drove the boat. The Captain was in charge. We found good anchorage on the west side of the island in about 30 feet of water. The divers reported it was in the low 50s as you descended with 47 on the bottom at 60 feet. The tide was high so lots of cold ocean water was packing in under the warm stuff. There was a decided thermocline at about 15 feet. The passing boat traffic had us grabbing for the handrails several times. The rolling soon quit and we were back to gentle rocking. Paul saw a dog fish. Peter recovered an anchor and long length of line with a shackle. It will probably be our new down line. The hunters found enough quarry to be happy with this beautiful site. We saw two free divers with their surface floats just off the ocean edge of the island. Pat and I sat of the swim platform and literally cooled our heels in wonderfully warm ocean. It was certainly in the 60s or my feet would have been red and throbbing. They weren’t. The second dive was also for hunters. We chose the eastern side of Kettle Island. It has large boulders and great habitat for prey. Paul saw a school of pollack and several flounders. It was in the high 40s on the bottom at 30 feet. Chilly for a day with full sun and 86 degrees and hardly any breeze on the surface. A little sea breeze from the east started while the divers were under. It helped some with the heat, but not much. Veronica brought us Weight Watchers “legal” snacks. Thanks to everyone, we had a great day. There was a fog bank in the harbor and a gentle breeze from the south. The weather report said it was going to freshen to 10-20 from the south. In either case, the fog would make diving south unsafe, so we drove up the Annisquam River to the north side of Cape Ann. There were thunderstorms predicted for later in the afternoon, but the white cloud bank north of us seemed to be scudding northeast. The Captain and I had driven around the cape in the early A.M. with our Tea/Bagel and Coffee/Corn Muffin (guess whose is which). We’d seen calm seas and no surge on the north side, so it looked good to go. Laurent and The Captain had practiced crashing and escaping in the marina, just for fun. That’s docking and leaving the slip for those who were never Coast Guard types. Laurent did great and now we have another set of eyes and hands that we could use in an emergency, should the need arise. We had Tom and Kathleen Childress of Amherst, MA and Laurent Dubois as well. The crew was Kathy Cardinale, Pat Walsh, Peter Donahue. I drove the boat. The Captain was in charge. This was Kathleen’s first dive off a boat after being recertified (with their daughter, Catie). She’d last been with us in 1998 at Kettle Island. In her honor, we went into Folly Cove and anchored off Calf Cove, its little shallow offshoot. Kathleen and Pat Walsh were a buddy team for her first dive. They found a lobster in a cave and several others that were either too big, too little, or preggers. I videoed in Calf Cove, The Captain videoed on the sandy plain of the cove, and Peter and Laurent hunted. It was 57 degrees at 20 feet with a noticeable thermocline at about 15 feet. 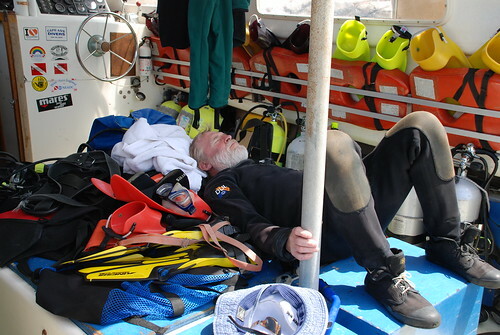 Above the thermocline was wonderfully warm, below it was shockingly cold – a mixed blessing. Because Kathleen did so well, we decided to go around the corner to Lanesville Shores, off the graveyard for a second site that possibly had more prey for the hunters. I anchored way in shore in about 20 feet of water. Here, it was 52 degrees at 30 feet, according to Peter. 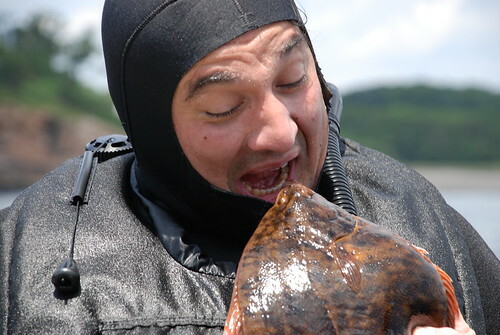 He also said he rescued a dog fish (small shark) from an abandoned trap. They are interesting to see because they look so shark-like, but they are small so their teeth wouldn’t hurt you. Their dorsal spine would, however, so we’re careful whenever we handle them during rescue situations. There were successful hunters on this trip. Kathleen and I saw golden fields of Irish Moss in 15 feet and other weedy tendrils that shimmered in the slight current. There were lots of crabs, both hermit and otherwise. While we were underwater, the front of thunderstorms that had been predicted formed over southern, coastal New Hampshire and formed a black wall with lightening and thunder. When Kathleen and I surfaced, Peter hustled us back onboard so we could make our run back down the river to the marina before the rain hit us. Kathy drove the boat and then Pat took it down the river and docked it in the slip. Great teamwork. Thanks to Kathleen and Tom for the scrumptious brownies, and to Kathy for the “legal” tuna sandwiches and watermelon, and to Laurent for the madelines. We were all well cared for today. Good fun was had by all. Yesterday’s long, low rollers were combined again today with a brisk north wind as the day started. We chose to go south to avoid the fetch a north wind would bring to the north side of the cape. We had Charles O., Laurent Dubois, and Joe Finkhouse as well as Pete, Pat and Veronica as crew. The Captain was in charge. I drove the boat. If you had something to do outside today, it would have been the perfect time to do it. 75 degree air, fresh dry breeze, and lots of sun made the surface conditions a picture postcard from New England. Underwater was a different story. Our first site was as protected as I could find to let Charles go through his skills and exercises for a basic scuba card. I chose the lee side of Salt Island off Good Harbor beach. I anchored in about 20 feet of water over flat, feature-less white sand. That way, if he dropped anything, we’d be able to retrieve it easily. He didn’t and we didn’t have to. The Captain and Charles went through the basics at the end of the down-line. Then Veronica and Charles went for a swim around the area. She said the surge underwater was disorienting and a little tough to take. Joe and Laurent each said they had seen several monster lobsters that were too big to take. For the second dive, I looked further north to be out of the rollers. Veronica said they were crashing into Salisbury Beach as almost standing waves. Loblolly Cove didn’t seem to be out of the way enough, so we went over to the southwest corner of Thacher Island. The surge was a little better here, but it was rocky and rolly up top. The water was only 20 feet deep and the wind was dying, so we managed. Pete took Charles for another expedition. They were hunting for lobsters for Pat Walsh. Through their efforts, Laurent’s, Joe’s, and Pat’s herself, she got her quota. Again, there were some too-big ones that were exciting to see alive and well and under a rock. The trip back was a little easier with the wind and the rollers at our backs. Thanks to Charles for the couscous and to Veronica for the “legal” snacks. We had a full charter with Laurent Dubois, Jacki K., Dianne Kelleher, Larry, Lihui Lin, and Richard Brandolini. Lihui was working on her basic certification open water and needed somewhere calm-ish and shallow-ish. The long rollers from the southeast were not friendly to anyone anchored out of the north wind. They had four dive boats all at the wreck of the USF New Hampshire at the same time. That was a first. I’d never seen so many dive boats at that site at once before. The vibility wasn’t very good – 10 feet. The water temperature was still cold at 52 degrees. We survived. The second site – Divers’ Leap – was a little better with 15 feet of visibility. The hunters were intent and Laurent spent 70 minutes searching for the critters. The water was only about 25 feet deep, but he was diving with a wet suit and said he didn’t mind it. Dianne and I each had only 1000 pounds in our tanks, but we swam to the shoreline’s rocks on the surface and then descended. We saw a strange sight at about 20 feet, where the sandy bottom meets the rocky edge of the shore: moon snail egg cases. They look like a ribbon or a collar and were lined up along the edge of the sand as though they were on display. I counted four in a row about 20 feet long. Pete said there were lots back at the first site as well. It must have been a good season for moon snail romance if there were this many egg cases as a result. We were happy to see the wind drop as the day progressed. That made the trip back to the marina a little less choppy, although the swells were as large as ever. We have had a string of nice weekends. Today capped yet another one, although the wind was brisker than would have been perfect. We had Bill Low, Dianne Kelleher, Patrick Scalli, and Laurent Dubois with Veronica Atlantis, Pete and Pat as crew. It was already blowing about 15 knots from the southeast when we decided to go north with the trip. I picked Hoop Pole Cove for the first site, once we rounded Halibut Point and saw the effect of the wind on Sandy Bay. We were joining another dive boat and were subsequently joined by another ourselves. This reinforced my view that the conditions were as good as possible with the wind from the south-ish. Everyone suited up and jumped in to get cooled off because the air was about 85 degrees and humid. The water was a shock at 52 degrees at 30 feet. The tide was coming in and bringing up cold, but not necessarily very clear water. It was only about 15-20 feet of visibility. Nevertheless, Bill Low found a teeny sculpin that was only about 1/4 in long. I saw little cunners and small stripers up in the golden Irish moss zone. Other folk saw pollack and more stripers. Not too many lobsters. The second site was a short jaunt into the teeth of the wind over to Gully Point, then closer in towards Old Garden Beach to avoid the two other dive boats that were anchored near the point, itself. Again we were all clustering in the lee of shore to avoid choppy conditions. This site had huge boulders and sandy spaces between them. I swam towards shore and noticed a large shadow cross a white lobster trawl line. It was a big shadow. Back on the boat, Veronica and Dianne had seen it too. It was a big striper, all alone and probably hunting for love or something to eat. You know how it is with those stripers. The water was pretty cold here too – 52 degrees in 20 feet. There was no thermocline as you went deeper, just some big (too big to take) lobsters that challenged some of the hunters. The wind was blowing off shore towards us and the conditions on the boat were perfect. There was some major sun-bathing on the bow as we waited for everyone else to come back to the boat. Veronica served The Captain and me her “legal” snacks and saved an apple for Peter, as well. There were some roast beef in bulky roll sandwiches, I heard. I don’t know for sure because I wouldn’t be eating any of them. No, not me. Too many Weight Watcher points in them guys. Yup. Our trip home was back the way we’d come, because the wind was picking up to 20-25 knots. It helped to have the whole cape blocking the force of the gusts. As Pete docked the boat, we applauded his skill and were glad to be on solid ground. At least I was. It was a perfect summer day in New England – a gentle breeze, bright blue skies, no humidity to speak of – a great time for diving. Pat Walsh and Peter Donahue were crew today. We had a contingent from Connecticut. Kevin and Linsley Mordasky, Pat and Karen Hatcher, Peter and Juli all were up for a trip to the wreck of The Chelsea. We were able to find it on our first pass through a combination of GPS waypoint, land bearings and sheer luck. Oh, and there was a buoy on the site too. Pete said that it was 45 degrees at 55 feet. The visibility was about 15 feet. It was an easy descent because we had strung a line from the boat’s stern to the wreck’s buoy. The divers just pulled themselves along it until they got to the bow and then descended easily right onto the wreck. As the tide peaked, the current lessened. We powered over to the Dead Light at Thacher Island for the second dive. I anchored in about 18 feet, but the stern swung as the tide turned until it was over 40 feet of water. It was much clearer here and warmer too. I felt a distinct thermocline at about 35 feet. Below that, the visibility was about 20-25 feet. Above that, the visibility was only 15 feet, although the temperature was up to 52 degrees. I saw some very big (too big to capture) lobsters and teeny, tiny fingerlings that might have been cunner. 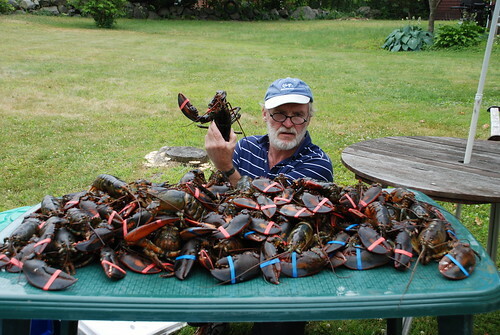 Pete saw a school of pollack and captured quite a few lobsters. The Captain and I were videoing, as was Peter from CT. Everyone else was just sight-seeing and exploring. There were large boulders up near the shore that were covered with golden Irish Moss which shimmered in the shallows. Many of the invasive species of tunicates were already covering large expanses of rock. Swim throughs and crevasses were everywhere. It is a marvelous site. We saw a seal in the open ocean on our way back to the marina. He quickly dived out of sight when we spotted him. There was a big white heron under The Gull Restaurant, picking its way through the nooks and crannies of the sunken barge that supports the structure. A great time with great people. Today’s dives covered the gamut from shallow/warm/clear to deeper/colder/darker. We had Veronica and her sister, Robin (from New Zealand), Jacki K., Andy, Laurent Dubois, and Pete and Pat as crew. The Captain was in charge. He picked the first place to be just off Good Harbor Beach’s rocks. It looked pretty clear as we set the anchor in 20 feet of water. There was no wind so the anchor didn’t take much scope and we were facing into the small ocean swells that were coming from the southwest. The rocks had hollowed out areas where the ocean had scoured the spaces between them. There were big boulders and sheer edges rising from the sand. I saw windrows of smashed lobster traps up against the rocky wall. I videoed a curious flounder and watched Sisyphus, the lobster. He was trying to push sand up a slope and it kept slipping back down into his den. The outlook wasn’t good for a clear hole in the near future. The water was 55 degrees and the visibility was about 15 feet. Everyone had done fine, and the ocean was almost flat calm, so The Captain decided we’d try the wreck of the Chelsea for the second dive. Pat used the hand-held GPS and we pressed GoTo so we could be led back to the waypoint we’d entered into it on the last trip we’d made there. It worked like a charm. The bottom angled up from 80 feet to less than 50 and we found the buoy marking the wreck on our first pass. There was a little current, so we rigged a line from the stern to the float line down to the wreck. That way, nobody had to chug too hard to make the bow and use up too much air just getting to the descent point. I was the last one in and got to shoot Jacki and Andy peering into holes in the wreck and investigating its debris. I also saw some lobster hunters. There isn’t much hull left, but it still looks more like a ship than does the wreck of the USF New Hampshire. It was cold – 45 degrees at 50 feet. The visibility was still around 15 feet. I used my tank and was glad to surface to more sun than clouds and a slick, calm sea. On the ride back home, we picked up a line and Pete volunteered to saw it free. This was just after rounding Milk Island, so it was probably a lobster pot’s fault. It only took a moment until Pete surfaced calling, “Can I log it?” Of course you can. Thanks to Andy for the authentic paczki, Polish plum butter-filled donuts, and to Veronica for the “legal” snacks, and to Laurent for the chocolat and moutarde. Don’t we have thoughtful customers and crew?